An exciting safe water balloon game, players are positioned in two firing stations. 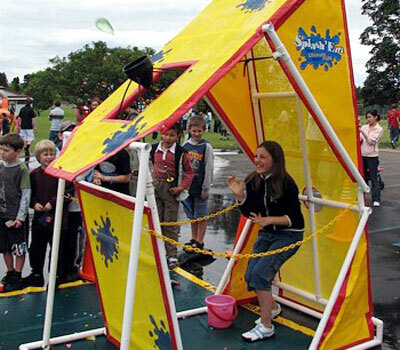 Each participant steps into a firing station with a bucket of water balloons. Inside is a balloon launching device. Players place balloons into the device and fire through the roof opening into the air. The balloon then soars across to their opponent’s station bursting down either on or close to them depending on the skill of the operator. The Aim: To have fun getting the opposition as wet as possible! This fast moving and highly contagious game is guaranteed to be a hit with kids and parents alike and a great way to have fun or fundraise this summer.